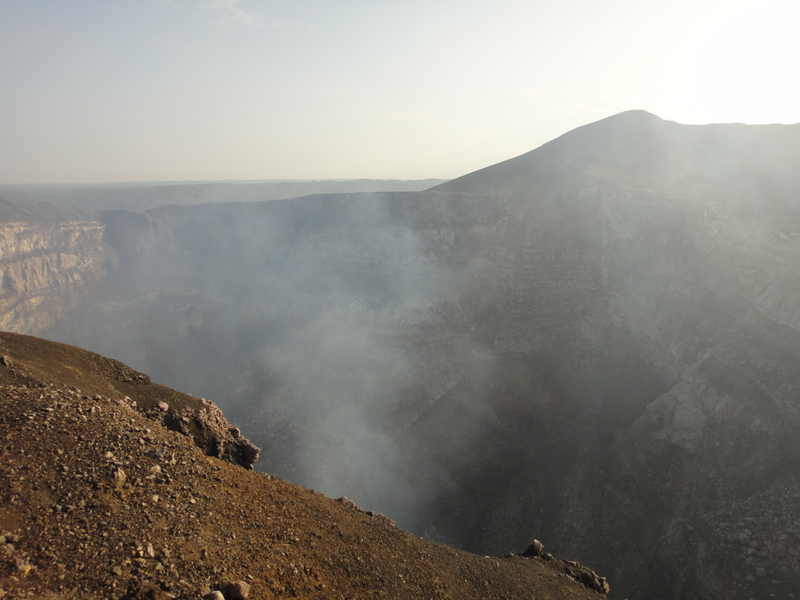 “The Volcano will give you about 15 seconds, no more.” That’s how long the Park Ranger gave us to stand on the exposed rim of Nicaraugua’s Volcano Masaya to peak into the nighttime darkness at the glowing furnace in the bottom of the very-much-alive caldera. Just before he outlined the time rule, he had explained that some portion of the rim crumbles every night, so there couldn’t be any dallying. Basically it came down to a game of odds. You were allowed a quick peak, and then you got the heck out of there. With no lights, guard rail, ropes or “crutches” of any kind, it was a crazy scene of disorientation in the dark, uncertainty where the trail was, sulfur gas burning your nostrils and throat, and serious adrenaline rush. But there’s a mystique and attraction associated with volcanos that’s been speaking to humans throughout recorded history. A volcano symbolizes power from within, creation, and connection to the source. It’s also symbolic of the element of fire and connection with the element earth. 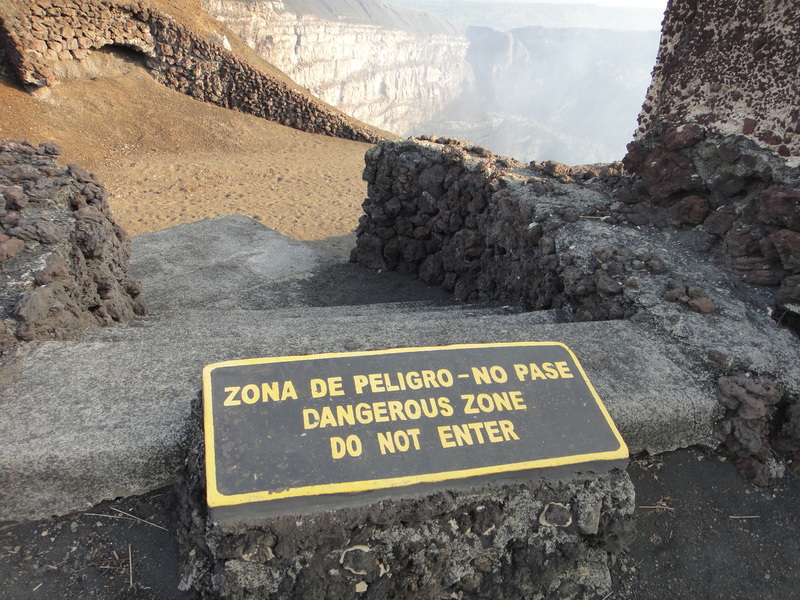 The chance to peak over the edge of the volcano rim felt like an initiation of sorts….did you have the courage to look deep within, to the core….. were you willing to face the fire within….with the obvious connection to courage to look deep within ones self. All of that…but I admit my mind was pretty blank when the ranger commanded “okay lets go.” I’m not sure how other people react when faced with moments like that, but when presented with similar situations….jumping off a bridge tied to a bungee, jumping out of the plane for a skydive, holding onto a rope swing and swinging off a cliff hundreds of feet above a jungle canopy… all questioning, fear, hesitation, and thinking in general, just stops, and I just do it. In the early days of human history, natural selection probably weeded people like me out of the gene pool pretty quickly! At the last second, that “human natural selection” process revealed itself….and about half the members in the handful-sized group of visitors ducked on the “initiation” and decided to pass on the peek over the rim. You may indeed need to practice some temporary insanity to experience Masaya – if you tend to think too much, I recommend passing on it and heading to the bustling market, which is exciting and lively in its own way. Having visited volcano parks throughout the United States, I had some perspective regarding what the Masaya experience would be like if it were in the States. I’m quite positive there wouldn’t be a Masaya experience in the States…..you wouldn’t be allowed within at least a mile of a volcano like Masaya. Part of the main viewing area…the wall crumbles here too. Masaya, you see, ain’t no sleeping beauty. It reeks of sulfur dioxide gas, which it constantly spews in large clouds. It’s cranky, having exploded a number of times in the last 50 years, with the last sizeable one being in 2008. In 2001 it erupted rocks that were tossed all the way to the visitor center, miles from the volcano, and injured a tourist on the site. Finally, to add just that right touch of intrigue, there is a human skeleton at the base of the rim – it’s too dangerous to retrieve this last suicide victim, which is only a handful of years old. I had been told this was maybe the most unique tour in the area around the wonderful City of Grenada, and I had gotten a ride there with my hotels’ resident guide. I was immediately struck by the remote and desolate feel to the place. 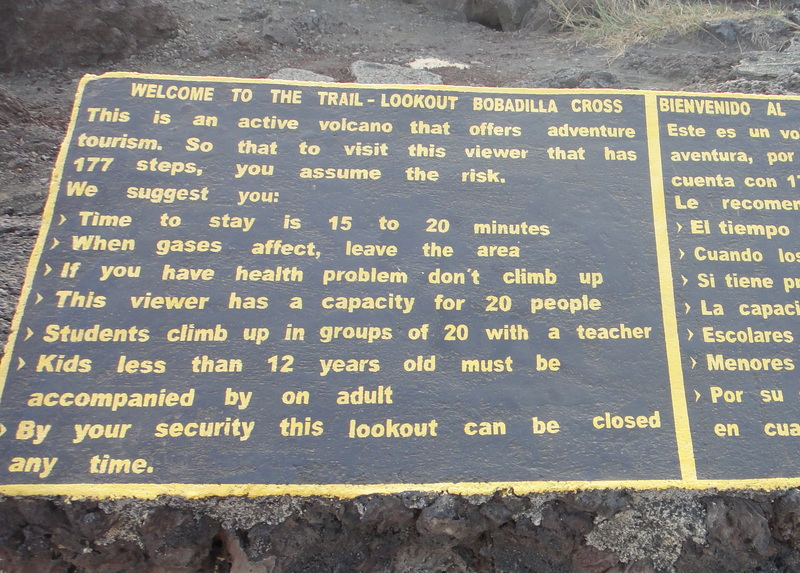 I didn’t need a guide or book to tell me this was an active volcano….I smelled it immediately. The landscape is extremely young with a great deal of exposed barren rock and ash, and little vegetation beyond grasses and small shrubs. The entire viewing and parking area is actually within a caldera itself; the land is really just a nested series of calderas, with the Masaya caldera being the “center” of the action. After snapping the obligatory “first view of the crater” pictures, there is a great rock stairway to a high viewing area at Bobadilla Cross just begging to be climbed. I climbed the 177 steps to the top, but descended fairly rapidly…the sulfur gas was just too strong. I wondered how the rangers were able to spend so much time breathing the burning air. The main viewing area. 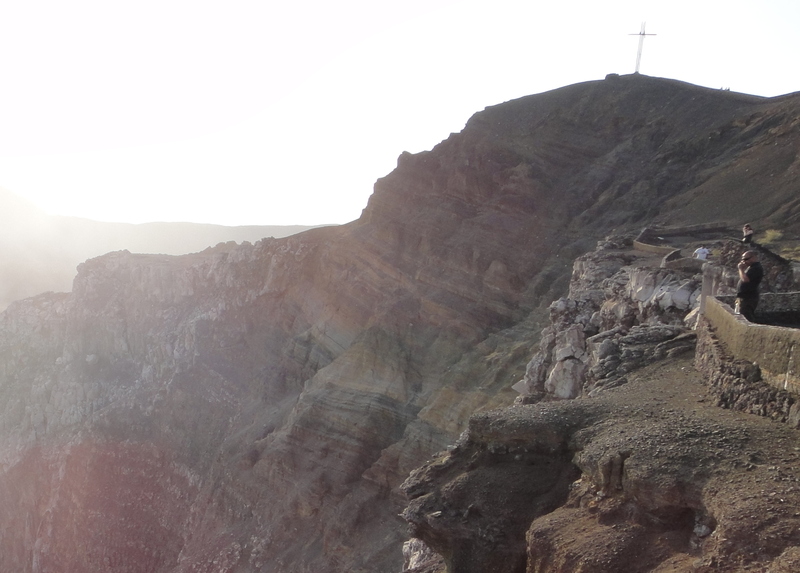 The cross in the upper right is the Cross of Francisco de Bobadilla is at the top of a high stair walkway…right on the edge of where the gases blew by, and not a place to linger. I struck up conversations with a couple of the park rangers at the crater. Their primary responsibility seemed to be talking on the walkie talkie to the headquarters, which monitors the wind direction. The wind was key, you see, because of the constant cloud of sulfur gas that Masaya belches. “Fun” in the visitor portion of the Masaya crater was only permitted when the wind wasn’t blowing the toxic fumes directly at visitors. In the event of a wind shift, visitors are directed to leave immediately. Aside from monitoring the wind, the guides are happy to answer your questions, and when conditions allow and there are interested visitors, they lead an evening program. First they stroll to a nearby ridge to watch the sunset. 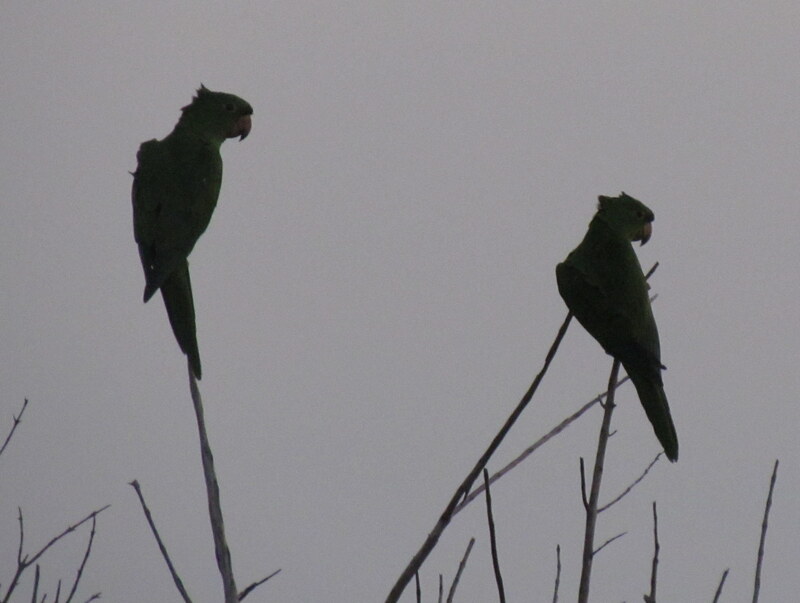 Then, as dusk sets in, they stroll to a vantage point to watch flocks of a unique species of green parrot, the chicoyo, swoop back and forth across the sky and then dive in kamikaze fashion into the volcano crater to roost on the crater walls for the night or head to their nests if it’s the breeding season. The parrots are unique because of how they have adapted to the high concentration of sulfur gas. I thought it was an amazing sensory experience, with the parrots chattering up a storm as they fly and stage, and then as they dip into the crater….abrupt silence. Donning hard hats and issuing flashlights, the tour continues with about a half mile walk well underground into a lava tube. The ranger explains that the lava tubes are actually some of the safest places to be near Masaya in the event of siesmic and volcanic activity. They tell of having been in the tubes during tremors and how they gently rocked. I decided I might like to fact check that one with my local volcanologist. Finally, the rangers lead you to the mouths of several bat caves. 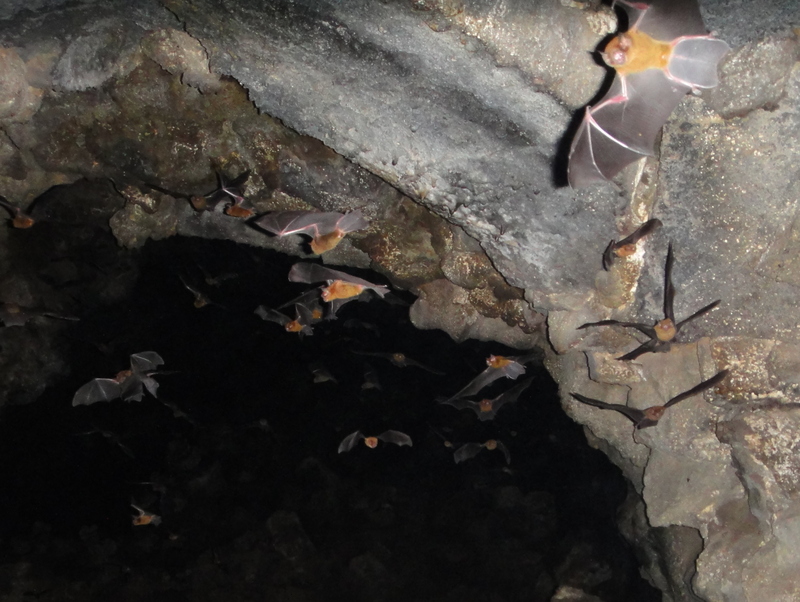 Thankfully they don’t actually lead you into the caves, which wouldn’t be good for either the bats, because of the disturbance, or for you, because of the potential to breathe in infectious spoors of several diseases. Kneeling in the opening of the cave, however, with hundreds of bats swooping past and seemingly straight at my head was amazing, and it reminded me of driving on a dark night in a snowstorm, where snow flakes in headlights shoot straight at you and blur past. When all the preliminaries are finished and its pitch dark outside, the rangers check the wind one last time, and then it’s time to head back to the volcano for the evening’s main event. The night-time viewing area is about a third of the way around the crater from the main viewing platforms, and it’s the best angle to see the nighttime glow at the base of the caldera. As for the view itself, well…… it wasn’t exactly like the scene in the Lord of the Rings where Frodo and Gollum are fighting for the ring above a boiling cauldron of lava. In fact it was more like a dull orange glow emanating from a deep chamber in the crater. This was the real deal though, not a computer-generated spectacle. I’m not including any pictures here of it, because my camera couldn’t capture the subtlety of the glow within the short amount of exposure time we were permitted, and to be honest, it would have been too disconcerting to hold the camera up to my eyes while at the rim anyway, so it’s a picture recorded only in my mind, and well, you’re just going to have to experience it yourself. 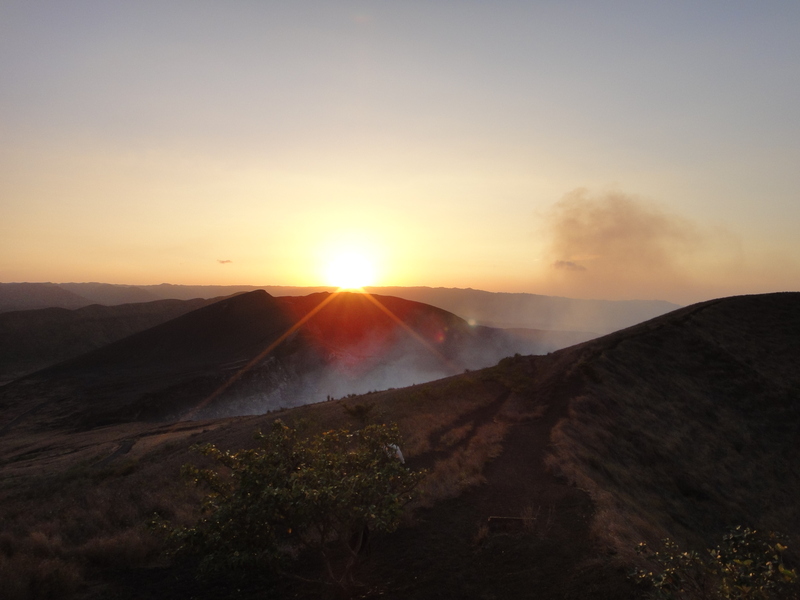 The entire experience at the Volcan Masaya Park qualified as surreal in my book and I was jazzed for a number of days afterwards. At least I think it was the lingering excitement, and not lightheadedness from having breathed in too much sulfur gas. 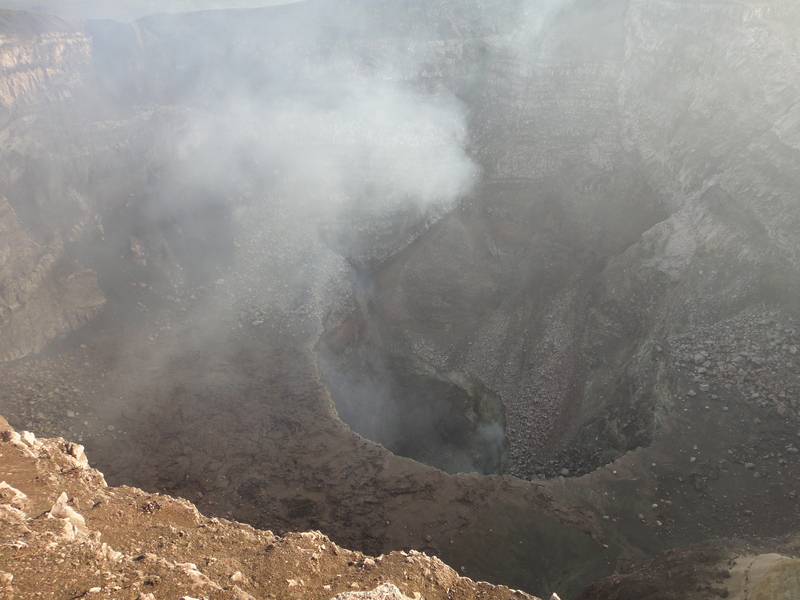 Masaya has been acting up again in 2012, with a crack in the dome appearing, and the degassing having increased to the point that it sounds like a jet engine. The good news if you are interested in the Masaya experience is that, despite the increased activity, the Nicaraugua Park Service has kept Masaya open to the public, and you can still get in on the tours. So the next time you get that urge to roll some dice, put aside those plans to head to Vegas, and book a flight to Grenada, Nicaraugua. Nicarauguans are friendly, your money goes far in the country, and you’ll have a great story to tell. That is, assuming that odds continue to work in the favor for adventurers sneaking that quick peek! In an upcoming entry, I’ll write about other places I visited in Nicaraugua, a country I thoroughly enjoyed, and touch upon some of the environmental and social challenges facing this proud Central American country.